is the name of our boutique style, French Town & Country, vacation rental service. We’re two Francophiles who met, fell in love, and married in Paris - and are living our dream, dividing our time between Paris and Loire Valley Chateau Country ... it just doesn't get any better ! We love our life in France - the culture, gastronomy, viticulture - and enjoy sharing our discoveries with friends and family. We are passionate about all France has to offer, and we’re delighted to point our guests, especially "Foodies", in the direction of the best wineries, markets, sites, and experiences not to be missed. Be an honorary Parisian, chez-vous à Paris, and enjoy the bounty of the local outdoor markets, café life, and local restaurants. We take care that each rental be unique, more than just a place to sleep, we offer a genuine hit of real life in France without sacrificing comfort for charm, and we take pride in doling out plenty of both. The Loire Valley is only one hour from Paris by TGV train and two hours by car, allowing us to offer a unique Town & Country vacation. 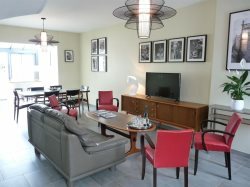 Experience la vie à la française ... independent, comfortable and authentic accommodation in one of our very charming My France Vacation Rentals properties !